Not the life of this world, but the LIFE ever after, the life of the flesh is temporary and the most important thing, in the entire world, in our entire existence, in EVERYTHING is the life that we can have after this race is run. HE is freedom, HE is grace, HE is loving, HE is all powerful and HE is worthy! He chose us before we would ever choose Him, He knew us, before we were ever formed and He stands at the door of our hearts, waiting patiently to be let in… He is faithful and He does not lie, if we but ask, He will come inside! There is nothing else worth as much, as salvation to the lost! May HE be praised, forever and ever, AMEN. I made this banner many years ago… feel free to snag and share! Is it just lil ‘ol me, or has the year flown by? May God bless and keep you and yours my friends, Happy Thanksgiving! Freedom of speech — as protected by The First Amendment of the United States Constitution — has been central to America’s philosophy since it’s founding. Yet, it’s been under attack on social media, in mainstream media and on college campuses. Twitter has been removing trending hashtags and banning users. YouTube has recently stopped allowing creators with controversial content to monetize their work. Even Apple’s App store is showing partisanship. For creators who have built their audience and business on these platforms, this is devastating. For readers who value free speech, this is equally devastating. Rational discourse is essential to surfacing facts and determining public policies and moral philosophies. But with big media and social media companies abandoning any resemblance of bi-partisanship, it’s becoming increasingly difficult for important ideas to be heard. Fortunately, Gab.ai has comes to the rescue. It’s a social network that puts free speech at its core. Gab is founded by Andrew Torba, who was previously Founder and CEO of a Y-Combinator backed adtech company. Traction: Rabid early adopters and highly influential creators. Gab has attracted influential and controversial voices like Mike Cernovich, Paul Joseph Watson, Milo Yiannopoulos, and Stefan Molyneux. For influential creators who are already very busy, there needs to be a good reason to join a new platform. The fact that they have is a testament to Gab’s value proposition. And the network is growing like crazy. 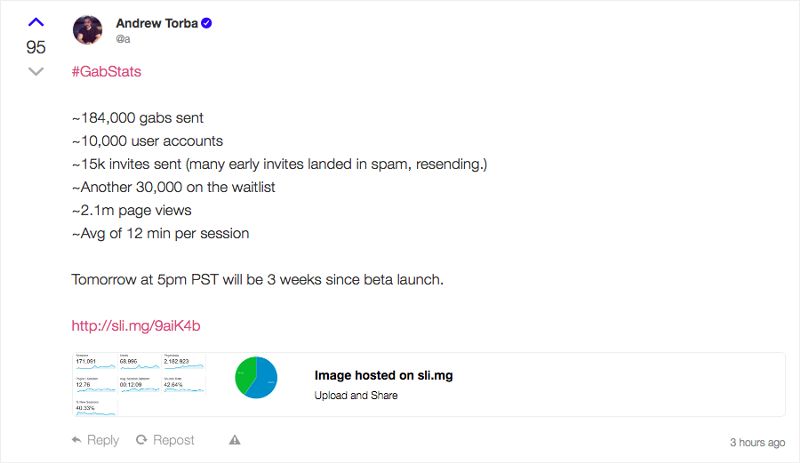 This is all within weeks of launching — making Gab one of the fastest growing consumer tech startups in history. It doesn’t have nearly the network effect of a site like Twitter to offer its users. The product is barely usable and is missing several critical features. They’ve done basically zero marketing. The success so far is a testament to the attractive value proposition they bring to the market. Product: Twitter + Reddit but with free speech. The product functions much like Twitter (with a touch of Reddit). Users see a stream of “Gabs” by the people they follow. Users can upvote or downvote and the top Gabs of the day are populated in a “Popular” stream. The “killer app” however is self-censorship. The muted words feature allows you to filter out topics — that way, you won’t see anything that may trigger you. Gab allows its users to determine what they do and don’t see. This is in contrast to big social sites who are increasingly censoring content from the top down. Soon after Gab’s launch, Twitter issued a press release saying they are working on the same self-censorship feature. However, Twitter’s dependence on revenue from advertisers make it unlikely to be able to truly enable free speech. So crazy traction, and attention from Twitter — not too bad for a three-person unfunded startup! Allowing creators to monetize through tipping, donations and subscriptions. Many aspects of the platform are open source so that there is full transparency about how they display content. The mobile app is on the way. Marketing: Add content fuel to the social media fire. Gab’s rapid growth is a living illustration of the possibilities of lower development costs and new distribution opportunities that The Internet has provided. They’ve narrowed in on their early adopters — free speech activists and conservatives who have faced the brunt of censorship. And now that they’ve validated demand for the product, Gab is poised to throw fuel on the fire. To continue to grow and reach new user segments, there are several potential strategies. First, they can keep drafting off Twitter — until they get banned. They have a great story and free speech is a hot topic right now (even Hillary Clinton has taken a stab at the “alt-right.”), so public relations can probably provide some short-term boosts. Over time however, given the nature of their vision — and because of the risks to any business of being dependent on any one platform — it would be beneficial to build up a fully owned platform. Strategic content marketing could be a great tool to evangelize the importance of free speech, build the brand of the company and the team, connect with more influential people, earn more press coverage and acquire users. In practice, this means going where their target users already spend time and providing education, news and entertainment in an engaging and provocative way. I would test out Medium and possibly a podcast to start. Over time, I’d build up a self-hosted blog. Throughout the process, I’d look at the analytics to see what channels and pieces of content work best and double down. Lastly, email marketing to increase retention and an invite system to increase referrals could be effective. The Internet and social media brought with it the promise that anyone with a message — no matter how contrary to the popular narrative — can be heard. Twitter, Facebook and YouTube seem to be aborting this mission. Gab is picking up where they left off. Instead of just complaining, they’re building a solution. 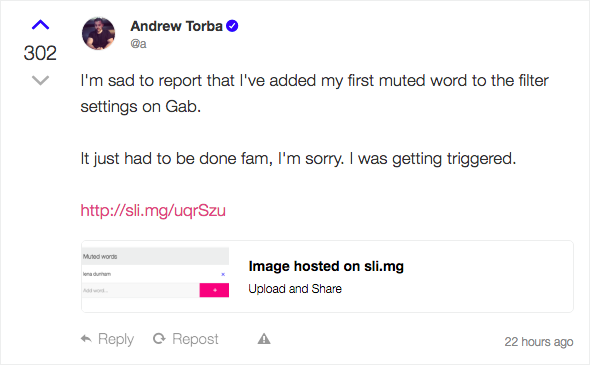 Gab’s traction shows there is clearly demand for free-speech. People are tired of fearing losing their job or losing friends over their beliefs. And there are so many important challenges facing our society today that need public discussion. Meanwhile, Twitter’s financial viability is uncertain. 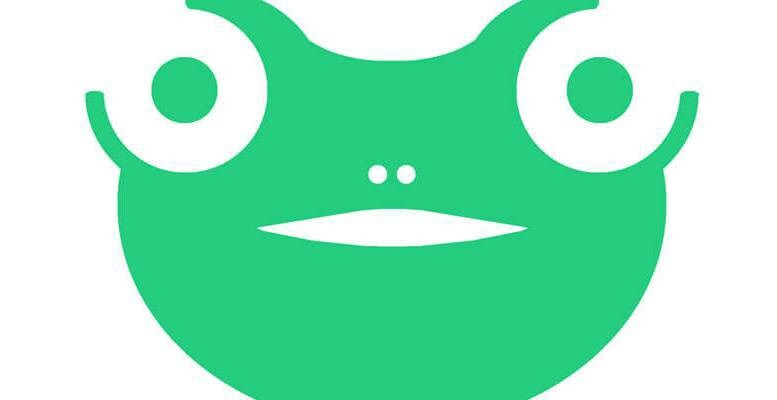 Given the huge and validated market for social media, the rapid growth they’ve seen so far and the importance of free speech, I’m very excited to keep using and following Gab! I pray our Father God blesses you and yours in Christ Jesus our Lord!! … may your faith bloom! How come I have no desire to keep up with blogging anymore? Oh well, just popping in to see how y’all are doing… hope this finds you content in His Presence and hopeful as well! YOU are going to DIE!!! Death stalks each of us… and whether it happens via a nuclear iran, disease, terrorism, or some other way, physical death will capture each of us… the only question that truly matters is… will you live? Did you know that the Bible tells HOW YOU CAN KNOW FOR SURE that you will have eternal life with God in Heaven? If you want to LIVE, there is a FREE GIFT that you can have right now… PRAISE GOD IN CHRIST JESUS! I can’t deal with today… the laws this nation has on our books not only go against GOD’s Laws, but they go against the very fundamental Constitutional rights of every individual (and State) within. I am spiritually sick. SOOO… I gotta rock’n’roll. Here for your listening pleasure… my ALL TIME FAVORITE BAND… AC/DC – ’cause I’m TNT… yeah, I’m dynamite… & I’ll win the fight! What has the Lord God called you to? Keep your eye on the prize. Run the race set before you, when you stumble, pick yourself back up, shake it off and continue on. We are each one individually called for a different purpose… satan and his minions are working overtime in these days, many, if not most, Christians are finding themselves under some pressure, and worse, under extreme persecution to the point of death. Why must we suffer?? Well, is He not worth it? The One who endured such extreme persecution and horrific death, The One who gave Himself as the ransom for others, The One who conquered death, rose again and sits at the Right Hand of God? OH YES, He is very much worth anything we endure. Times will come for each and every believer when they will find themselves in the fire and there will be many who question and even turn their backs on our One True Lord… we must prepare ourselves spiritually, to be able to endure and stand physically. What has the Lord Christ Jesus, our Holy God, called you to? For me personally, I keep praying that no matter what the circumstances of my life are, that I cling tightly to the One who is my Salvation, nothing else matters, nothing. I wrote this for me, a reminder which I need on a daily basis, but sharing in case there is any other who need it. May our Lord God’s Will be done in earth, as it is in heaven and may all glory, praise and honor be His forevermore, AMEN. But, as it is written, “What no eye has seen, nor ear heard, nor the heart of man imagined, what God has prepared for those who love him”. . . .
For it has been granted to you that for the sake of Christ you should not only believe in him but also suffer for his sake. . . . FAITH, FAMILY & FREEDOM... I'm a Christian Conservative Constitutionalist , a blissfully happy wife, mother of three fantastic children, born in 1991, 1992 & 1994 and Granni of two darlings, born in 2009 & 2012. We home schooled our kids from 1998 until the last one graduated in 2012. 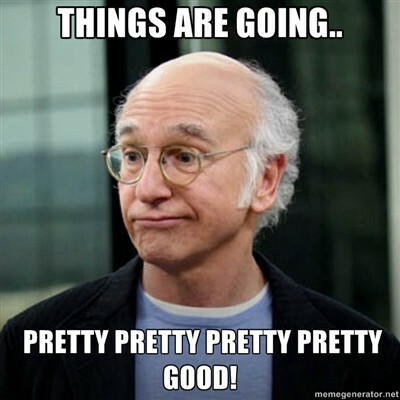 I'm a news & political junkie, a total 80s chick to the max, was diagnosed with MS in 1993, and have been striving to live a healthy weight lifestyle since 2007... I love Christ Jesus, my family, the USA, my furry babies, Cinderella, singing & dancing, The Pink Panther, nerds, the Komodo Dragon, falcons, making computer graphics, candles, rainy days, Sept thru Feb & the 1920's to 1980's style & decor. Online I am TeachX3 (since 1999), don't fb or tweet, but hang out at news blogs. ... So Glad You Stopped By! Because, if you confess with your mouth that Jesus is Lord and believe in your heart that God raised him from the dead, you will be saved. For with the heart one believes and is justified, and with the mouth one confesses and is saved. WANNA KNOW MORE? "Upon the end of my time, my prayer is that I can say: I have fought the good fight, I have finished the race, I have kept the faith."